Prog-metal and fusion virtuoso and Cort electric guitar artist Hedras Ramos will embark on a USA tour which starts on May 1 in Hollywood, California and concludes on May 30 in Dallas, Texas. 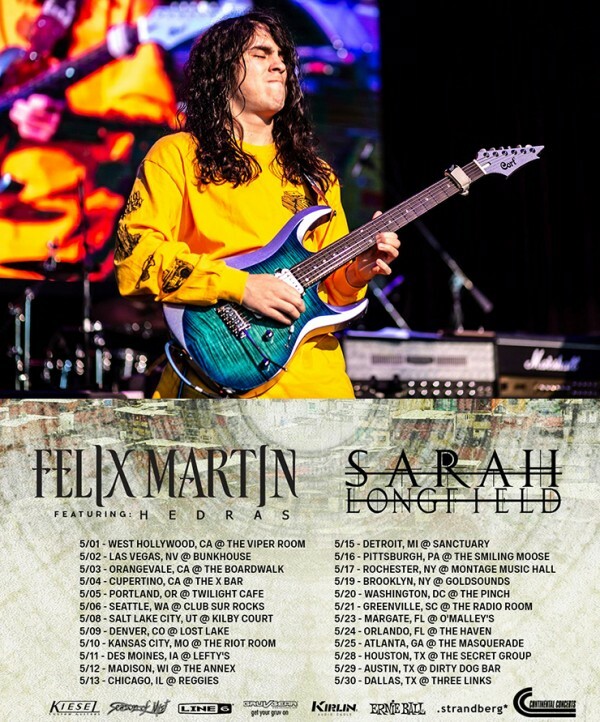 Having moved to the US in 2018, Hedras has quickly established himself in America with a growing fanbase and joins Felix Martin and Sarah Longfield on his first US tour that will further raise his profile in the prog music community and provides an exciting opportunity for fans to experience his vaunted virtuosity and musicianship in person. For this tour, Hedras will take his Cort Signature model on the road along with the new X700 Duality introduced at the 2019 NAMM – the new flagship of the X Series lineup. Developed with the young metal guitar players in mind, Hedras contributed various ideas both visually and technically for the look and features that will appeal to the tastes and requirements of millennial era musicians. With concepts and ideas like the striking multi-tone body finish with highlighted contours and illuminlay side dots that are typically only found on super-expensive boutique type instruments, the X700 Duality has the visual vibe that the new generation of young players look for. The robust, punchy and cutting acoustic character of the guitar is faithfully captured and sent to your amplification systems with the Seymour Duncan SH2N and TB4 humbuckers with a special 5-way wiring that provide a wide variety of humbucker and single-coil tones for virtually any genre or style of music. Special attention was paid to the bridge with its solid steel plate and block as well as solid stainless-steel saddles to maximize the transfer of string vibrations to the body and the neck of the guitar, resulting in greatly increased sustain, punch and volume. Furthermore, unlike typical fulcrum tremolo systems, the bridge is recessed for pull-up as well as push-down, expanding the capabilities of the guitar. The wide tonal possibilities as specified by Hedras reflects the versatility required by today’s young prog-metal and fusion players who are constantly experimenting with sonic textures in their music. We look forward to following this tour and will provide further updates in the future through our social media channels. If you see this tour is rolling through your town, please mark it on your calendar to catch Hedras and these exciting Cort electric guitars in action.